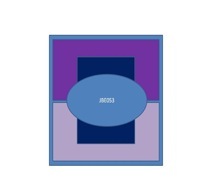 This week at Jacksonbelle we have a terrific sketch to work with! I decided to make a square card, and it is the last of my Mother’s Day cards. And since she reads this blog, she’ll know this one is hers, lol. I was seriously apprehensive about putting this sketch together — for some reason it was a bit daunting to me. But that’s what sketches are all about – stretching your imagination! I think it was the different top and bottom panels that tripped me up. Eventually I got it though! My center panel is mostly Cuttlebugged – I tried to leave the bottom portion not done to give it a “fade in” kind of look. 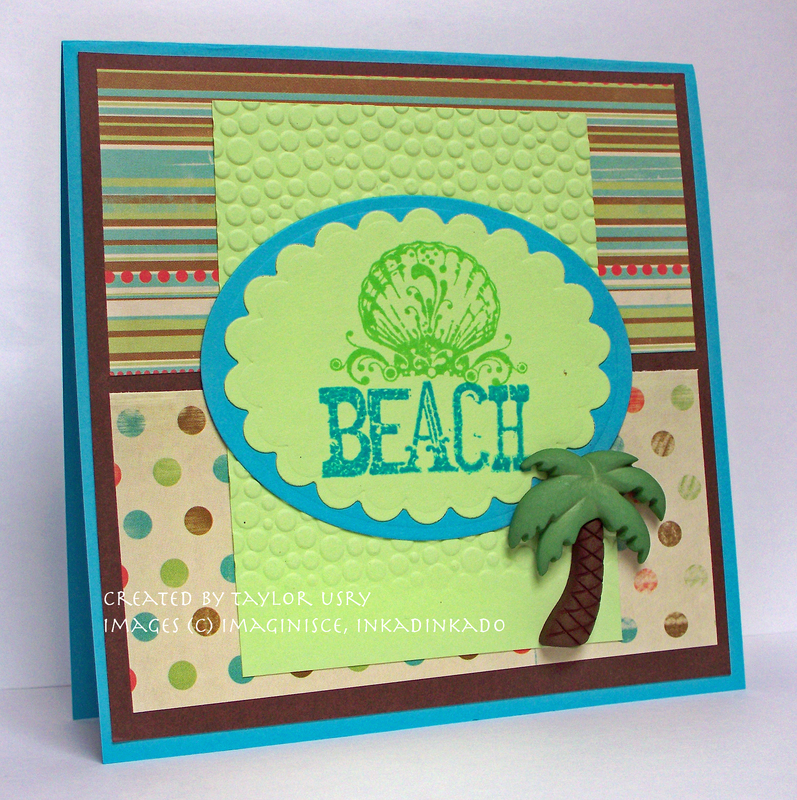 My mom lives at the beach and loves beach themed cards, so that’s why I went with this Imaginisce stmp and the Inkadinkado shell.Actually, I boutght both of them with her in mind – good thing I have finally inked them up! I added a palm tree to make the card a bit more fun, and then left it alone. I love the bright colors and patterns – so thanks to whichever JBelle genius (Lynda) that came up with this sketch! How amazing is his crocheted flower??? It is handmade by an awesome crafter who is probably familiar to lots of you – her SCS screen name is lacyquilter. Her real name is Melody, and her blog is called Lilacs and Butterflies. Lindsey at Jacksonbelle will be taking pre-Orders from May 1st-15th. On May 16th, I’ll order them and ship out ASAP. There are 8 flowers per package. Each package will include either 1 white or vanilla. The rest are assorted. The price is $7.99, shipping will be $2.25 for up to 10 packages. To order, email Lindsey at jacksonbelle@hotmail.com for orders. She will accept Paypal, money orders or checks. But you MUST pay before the 15th. 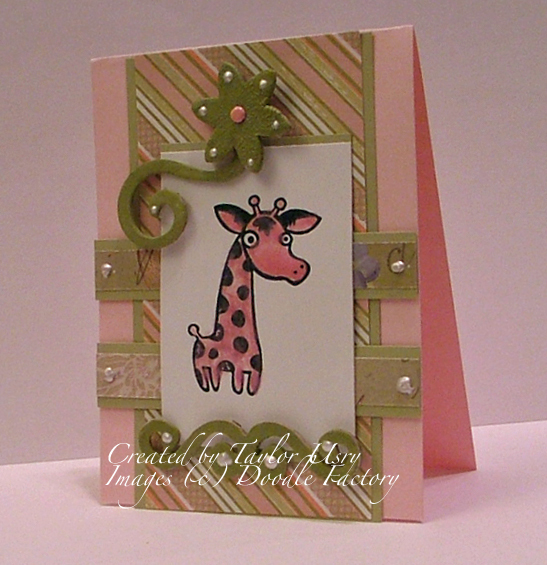 My sentiment is an adorable Studio G stamp that i got at Pez-a-Doodle Designs. I used Tim Holtz distress ink in Frayed Burlap to stamp it onto the cardstock, and it matched the brown in teh dp perfectly!!! If you are in search of a variety of Tim Holtz products, I cannot stress enough what an awesome selection Marti has! She also has these fabulous new goodies called Pez-a-Blings — you have to check them out. They are small squares that you can use just like Dew Drops — I love them! They come in fab color assortments – you won’t be disappointed! It’s Challenge Time with the JBelle Girls! This week’s Jacksonebelle Team challenge is to create a card using the white on white color scheme. I’ll be honest and say this really stumped me, because I decided in my mind I wanted to make a black and white card. I’m so stubborn, I know! I ended up getting a pre made A4 card out of my stash – it came white, lol. I used some Daisy D’s rubon’s in each to corners, and then added one of my new Memory Box stamps to the upper layer of my Nesties center panel. 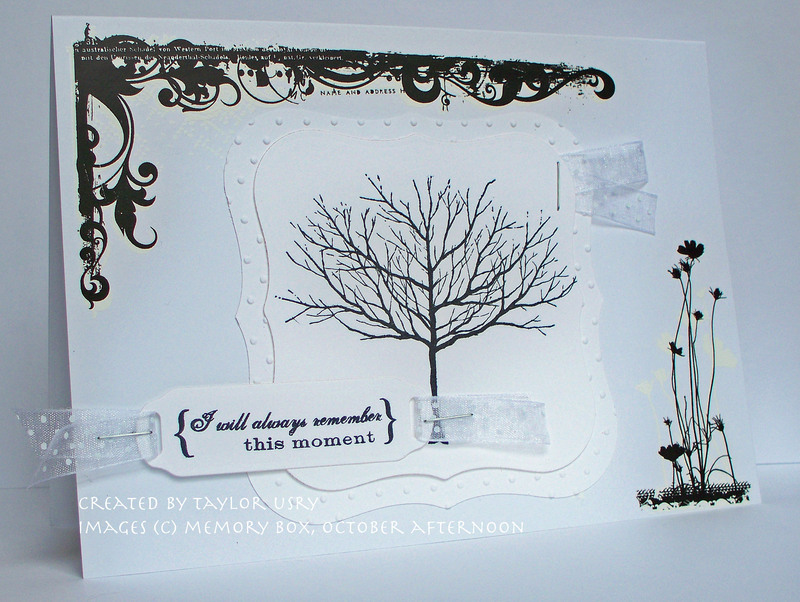 I used one of the Ribbon Tag trio for my October Afternoon sentiment, and added some Swiss dot ribbon by May Arts. What do you think? This is Kisa’s card. 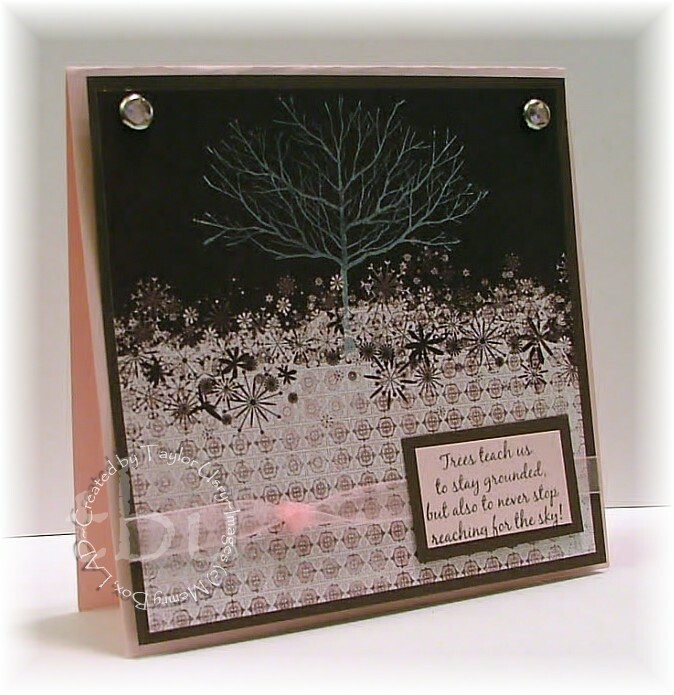 The JBelle DT members all CASE-d one of her cards this week, while she cooked up the cutest tutorial for y’all! I fell in love with this ard immediately when I saw it on her blog. I was immediately drooling over her sketch, and knew I had a giraffe somewhere that needed some love! She specifically stated she wanted to keep it boyish, so my brain clicked and I decided I’d do a girlie version! After all, there must be a girlie version of all things boyish, yes? This is my version. LOL, it looks a little top heavy, but that is because I forgot to straighten the pic! 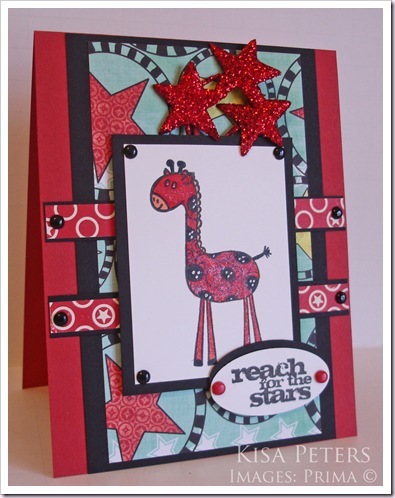 Obviously, the giraffe is different (hers – Prima; mine – Doodle Factory), Instead of sparkly stars at the top I painted chipboard with Tim Holtz distress paint. And no brads for me – I used Liquid Pearls in White Opal everywhere. I used a piece of painted chipboard at the bottom as well, in place of a sentiment. I colored my giraffe with a copic marker, and then added Shimmer (Pink) Paint as my finishing touch! I love her, and this layout! THANKS KISA!!!!!! Now, remember to check the JBelle Blog for her awesome tutorial and check the DT members blog’s to see what they’ve created! And oh, how could I almost forget this exciting news: From Midnight tonight untill Midnight on Friday , the SHIMMERZ ARE ON SALE!!!!! Aaaaaack! That is so exciting! They will all be 15% off. AND Lindsey has 4 new colors of paint in stock, and 2 new colors of blingz!! I’m sorry I’m posting so late again – we’ve had a bit of drama with the car wreck I was in, and the other person’s car insurane. *sigh* Why do people have to be rude? What is gained from that? Anyway – on to more fun things! I *love* this big butterfly by Inkadinkado!!!! All of the stamps are from the Garden Delight clear acrylic set. How stunning is it? And I love the craft white ink on the black paper – always a stunner in my book! I colored the butterfly with a Copic (RV14) after stamping him in Tuxedo Black by Memento. Where did I get this fab sketch, you ask?…. Darling, isn’t it? And even better: Now, all you have to do is make a card based on this sketch, leave us a comment here on this post with a link to your card by Friday the 13th at 3pm EST and then check back Saturday morning to see if you won the random drawing!! Sound good, well get busy!!! LOL!!! OK, before you get busy, Lindsey has put ALL the Inkadinkado stamps on sale for today (Tuesday) through tomorrow (Wednesday) at 12pm EST. Some stamps are on sale below cost so it REALLY will be worth it for you to stop on by the store now!!! LOL!!! We have a special treat for you today! We have a sketch, a contest and a prize! Sound like fun? 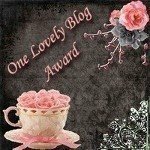 I can’t wait to head over to the JBelle Blog to see what everyone comes up with!!!! 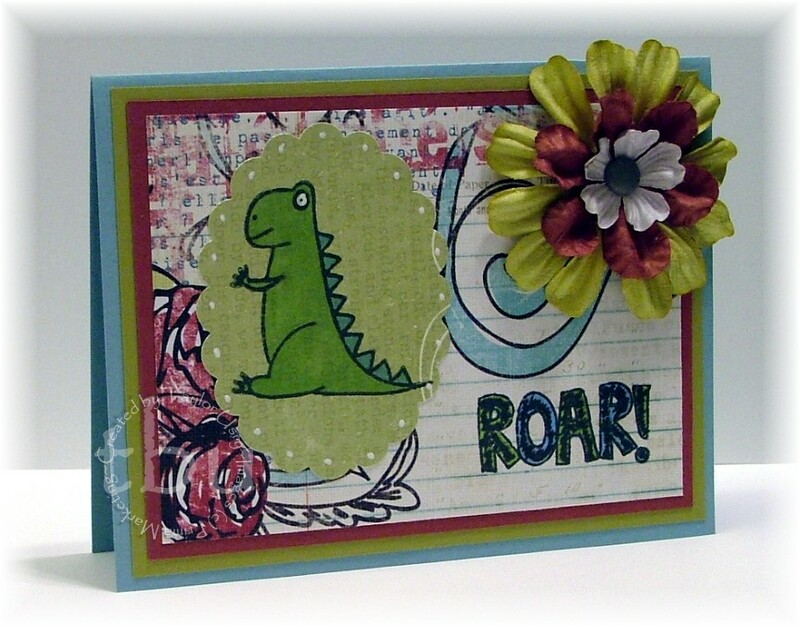 This week over at Jacksonbelle we are celebrating all things Prima — paper, stamps, flowers — all of it! I just love this chubby little acrylic dinosaur set. So fin!I started my card by matching up colors – Baja Breeze for the blue, Kiwi Kiss for the green, and Cranberry Crisp for the red. Then it was a matter of finding just the right size scallop punch to hold him – I ended up going with the Marvy Scalloped Giga.I colored him with Copics – YG03 and B32.And of course, then his little eye looked sad – but a white gel pen fixed that right up. I also used the gel pen for dotting the edges of the scallop. My dp is from the Angelique collection, which was recently on sale — I *heart *sales! This pattern is called “Angel Kisses” and I am in love with it. I put the “ROAR” on a line, and even though it came colored with black ink (Tuxedo Memento Black, actually) I colored over that with the Copics I mentioned earlier. Then I went digging for flowers. Of course, since I possess so many, it didn’t take long to come up with a match, lol. You can find more details about this card by going to the Jacksonbelle Blog 🙂 Today, it is all about the Memory Box!